The program that was given to the audience explained the background and history of Medea and her husband Jason. Photo by L.Cowan/Setonian. 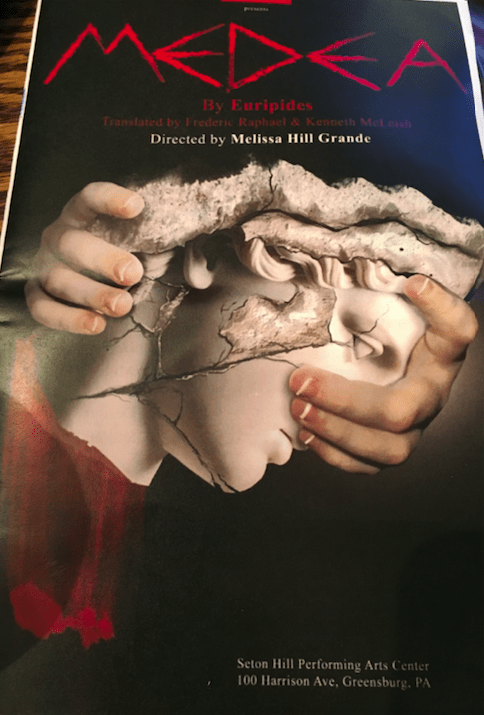 The audience was taken on a journey to Greece when the play “Medea” was performed at the Seton Hill University Performing Arts Center in Greensburg. SHU’s theatre students took on the roles of the characters and put on a show from March 31-April 8. There were multiple standing ovations in the William Granger Ryan Theatre on Saturday, April 1 as actors came onto the stage to bow. The youngest actors, covered in fake blood with smiles on their faces, evidently had a wonderful time acting throughout the play. “Medea” is about a demigod who betrays her hometown to live with her husband Jason and their two sons. Getting betrayed herself when Jason weds the princess of the land, Medea seeks revenge by killing not only the princess and the king, but also her two boys as well. Elena Falgione starred as Medea with Cameron Nickel portraying Jason. Medea and Jason’s sons were played by 11-year-old Lindsey Grant and 10-year-old Mia Jordan. Other cast members included Angela Mazzocco, Jacob Westwood, Paige Overly, Rhiannon Owen, Halle Polechko, Jamie Pasquinelli, Élena Bravo, Tasha Matthews, James Scharer, Travis Miller and Ian Denham. “Medea” was also guest directed by Melissa Hill Grande. SHU’s World Drama class was encouraged to attend one performance night in order to compare the script and the play. In one translation, the murders of the two sons were different, but there were no major changes from script to play. The longer speeches from characters such as Medea or the nurse were fluent and word for word. 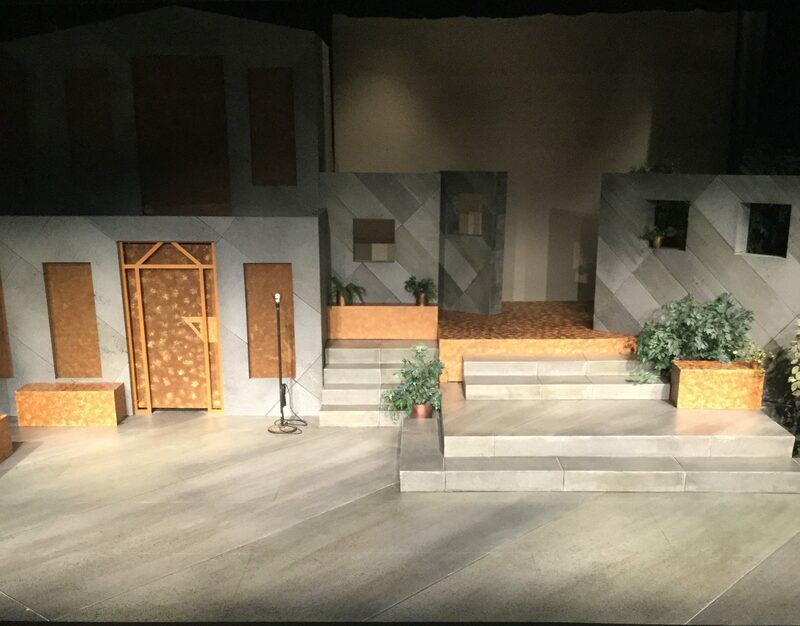 Shown above is Seton Hill’s set for “Medea.” Set design by Karen Glass, costumes by Kristina Miller, lighting design by Greg Messmer, sound design by Ken Clothier and Tech. Director: Thomas K. Crowly. Photo by M.McGraw/Setonian. Jason’s character could be described in different ways, depending on translation. The play portrayed Jason as the antagonist of the story who seemed like he didn’t care about the major conflict, giving snarky remarks and casual eye rolls. The play was performed well, with no noticeable mistakes from the actors. The acting followed the script closely and with precision, and the program given out to audience members explained the history behind “Medea” and what happens when the stage lights go out. Nearing the end of the play, audience members watched as Medea, who had completed the task of murdering her beloved sons, came out with the two still boys beside her on a balcony. It was a gruesome scene that some audience members were not expecting, as you could see by raised eyebrows and open mouths. Fake blood was bountiful and there were a few whispers in the seats. It wouldn’t have been complete without a small sneeze from one of the ‘dead’ little boys. A few laughs were heard from the seats as the play continued. All slideshow photos by M.McGraw/Setonian.